Different bowing gestures or articulations give the violin a range of different sounds. The differences are chiefly in the transient sounds at the beginning and end of the notes, and in the envelope: the way the sound varies over time. These are illustrated with sound files and oscillograms. Vibrato - a small cyclic movement of one of the left fingers on the string - changes the pitch of the note played. It also changes the amplitude and the spectrum. This variation as a result of vibrato is very important to the characteristic sound of the violin. This page explains why, using sound files and graphical representations of the sound and its spectrum. Articulation and the sound of the violin. A look at several different bowing gestures. Vibrato and the sound of the violin. An analysis of pitch and timbre vibrato and their importance to violin sound. 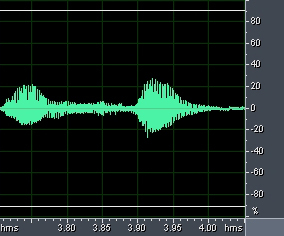 In the middle of a long, sustained note, each vibration of the violin string and each cycle of the sound it produces is nearly identical to the one that preceded it. The string undergoes Helmholtz motion, which is shown in animation in Bows and strings. This is what physicists would call steady state. However, much of the interest in violin sounds comes from the transients: the short lived effects at the beginning and end of each note. To the violinist, these are achieved by different articulations or bowing styles. All of the examples in this section show oscillograms and sound files. The oscillogram plots the voltage from the microphone (in linear but arbitrary units) as a function of time (measured in seconds). The voltage is proportional to the sound pressure, which was measured one metre from the violin in a room with very low reverberation. The violinist is student Tricia Ho, who worked in the Music Acoustics lab in 2005. In each case, the first oscillogram is that of the sound file. A section of it is highlighted. The highlighted section is then shownin the next oscillogram, with the time axis magnified. 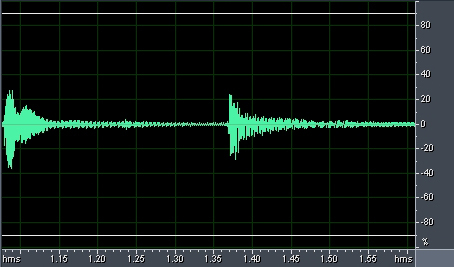 Here we are not concerned with the details of the waveform, but rather with its envelope, ie the way the magnitude of the wave changes over time. You may wish to revise Bows and strings, Strings and harmonics or An introduction to violin acoustics before proceeding. Col legno is an unusual articulation. The Italian col legno means 'with the wood' and that is just what the violinist does: s/he plays the string with the wood of the back of the bow, making a rattling sound on the string. In the oscillograms below, notice the loud initial transient as the wood strikes the bow percussively. The magnitude of the sound then decreases rapidly, because the wood does not input energy effectively as it is dragged over the strings (unlike the Helmholtz motion produced by the bow in its normal use). Sound files of col legno. The French collé means 'glued'. The lower part of the bow (which can exert more force) strikes the string rapidly. The sound builds up rapidly at the start of each note, and then slows smoothly (perhaps like two surfaces with fresh glue?) before lifting off. Collé is somewhat similar to saltando, except that the latter is performed with the upper part of the bow. Pizzicato means plucked with the finger. The fleshy ball of the finger is used, rather than the nail. Once the string is released from the finger, there is no effective mechanism for putting more energy into the string (although violinists may try to prolong the sound by adding vibrato with the left hand). Consequently, the sound has a moderately large magnitude initially, but decays rapidly away. The Italian spiccato means 'enunciated'. The bow lands percussively on the string and remains in contact while it is drawn across a little. The attack (the initial transient) is not so rapid as in col legno, because the bow hair is softer than the wood. Further, there is time for the bow to provide some continuous input of energy before it 'bounces' off the string. Spiccato is somewhat similar to sautillé. The Italian sul ponticello means 'on the bridge'. Bowing the string over the bridge, it is virtually impossible to set up stable, regular Helmholtz motion, and rather easy to excite, at least briefly, some harmonic Helmholtz motion (both are described in Bows and strings). 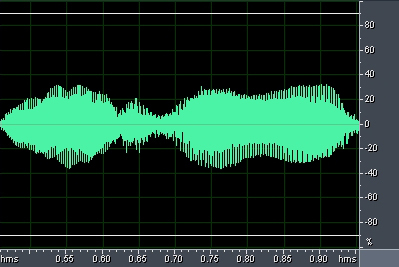 This gives a peculiar and irregular sound, with lots of high harmonics. Sound files of sul ponticello. Sul ponticello contrasts with sul tasto: in the latter, the string is bowed over the fingerboard, which is unusually far from the bridge. Sul tasto (next heading) produces much less power in the high harmonics, which we show by comparing the spectra below. 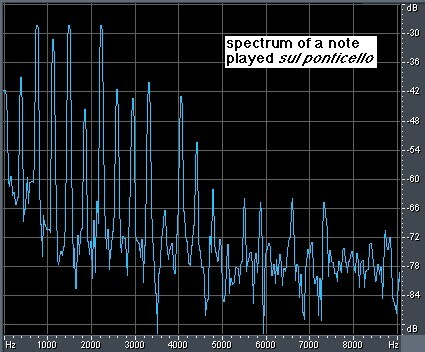 The first spectrum is for a note played sul ponticello, obtained from the sound files shown in oscillograms above: note the weak fundamental and the strong harmonics. The second spectrum is for the same note played sul tasto, ie with the bow well away from the bridge. 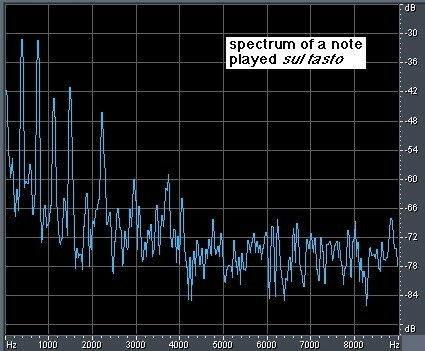 We discuss sul tasto further below, but notice in the spectra that playing sul tasto produces a sound that is relatively weak in high harmonics. Sul tasto means 'on the fingerboard': the string is bowed over the fingerboard, near the end. This position produces a sound with weaker high harmonics than normal playing (bow between fingerboard and bridge) and much weaker than for sul ponticello. It is rather similar to flautando, which has a sound somewhat like that of a flute: less strong in high harmonics and with a little broad band sound as well. The spectra above contrast sul ponticello and sul tasto, so it is interesting to compare the sound files, too. Sound files of sul tasto. In tremolo, the bow remains in contact with the string, but the bowing direction is changed rapidly. The rate of bowing is usually left to the performer so, in a violin or cello section, a tremolo note will have usually have bows moving in random phase. Vibrato is an important part of the playing style and sound of the violin and related instruments, especially in the music of the romantic and most post-romantic periods. The regular rocking backwards and forwards of the finger on the left hand that stops the string changes the length of the string (and also, slightly, the tension). This causes a cyclical variation in pitch. Let's see how important it is. Tricia plays the note A#4 (sul A) first without and then with vibrato. A#4 senza vibrato. A#4 con vibrato. 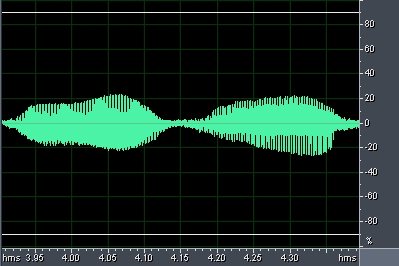 Here is an oscillogram of the second sound (the note con vibrato). Note the regular changes in the envelope, which varies about six times per second - a typical rate for vibrato and a comfortable rate to rock one's finger. At each of the two times indicated by the vertical dashed lines, we calculate the spectrum of the note. These are shown below. First, notice that the pitch is different - this is clearer for the high harmonics than for the fundamental because, while the proportional change in frequency is the same for all harmonics, its absolute value is greater for high frequencies. 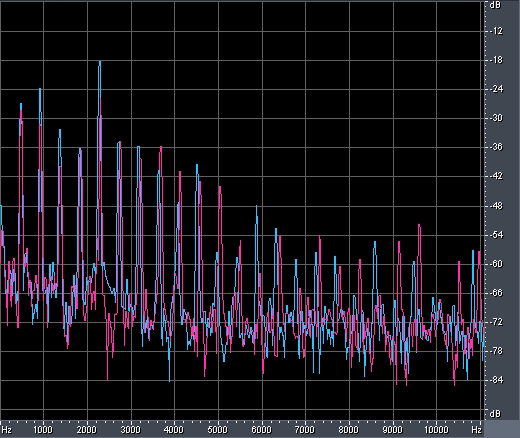 So the violin note con vibrato has varying pitch, and strongly varying spectrum. Why does this make such a huge difference? The main reason is that human perceptions have evolved to notice things that change in time. Further, our auditory system works well for human languages, which encode most of the information in the spectral envelope. (This scientific paper has some comparisons.) So variations in the spectral envelope and especially the amplitude are readily perceived, and they make the sound more interesting or 'alive'. 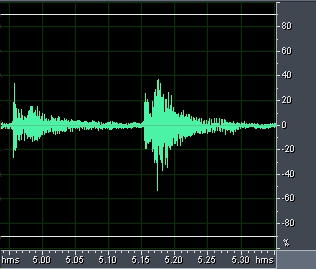 Now all of the sounds we have heard above were recorded with a close microphone and in room with very little reverberation. This means that we hear something like the sound that is output by the instrument. Commonly, one hears an instrument from some distance, and in a room that provides reverberation. So one hears the direct sound coming from the instrument added to the sound that is reflected off walls, floor and ceiling. In the case of a note senza vibrato, this makes relatively little difference. The frequencies of all the reflections are the same, so they all add up to make a relatively simple note. In contrast, when playing con vibrato, the delayed notes may have different frequencies, and that difference changes with time. This gives rise to complex interference effects. In the sound files linked below, reverberation has been added to the sound files linked above. So, the complicated frequency response of the violin, when combined with vibrato, results in a sound is more complicated and 'alive' than a note without vibrato, and this sound is further complicated when reverberation is present, because this adds strong variation in amplitude due to the interference effects. The research papers of John McLennan, PhD student in Music Acoustics at UNSW. How do violins change with playing and environmental changes over time? : a report after the first three years of a long-term study. And finally, yes, we felt obliged to put on our FAQ some comments about that hoary old question "what was the Stadivarius secret? ".